In Visual Basic 2015, we can write code to instruct the computer to perform mathematical calculations such as addition, subtraction, multiplication, division and other kinds of arithmetic operations. In order for Visual Basic 2015 to perform arithmetic calculations, we need to write code that involves the use of various arithmetic operators. 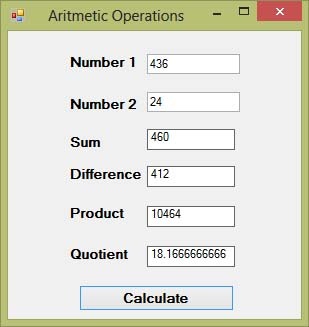 Visual Basic 2015 arithmetic operators are very similar to the normal arithmetic operators, only with some slight variations. The plus and minus operators are the same while the multiplication operator uses the * symbol and the division operator use the / symbol. In this program, you insert two text boxes, four labels, and one button. In the properties windows, change the name of the button to BtnCal, the names of text boxes to TxtNum1 and TxtNum2 and change the names of labels to LblSum, LblDiff, LblPdct and LblQuo respectively. Click the button and enter the code window and type the Visual Basic 2015 code as shown below. 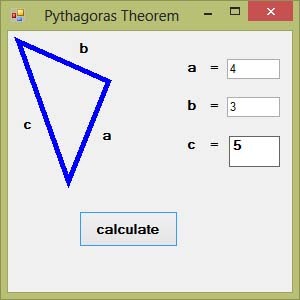 This program involves the use of Pythagoras Theorem to calculate the length of hypotenuse c given the length of the adjacent side a and the length of the opposite side b. In case you have forgotten the formula for the Pythagoras Theorem, it is written as c^2=a^2+b^2 in Visual Basic 2015. In this program, insert two text boxes for the user to enter the value of side a and the value of side b respectively. Add a label to display the result, which is the length of the hypotenuse. Lastly, add a button and change its name to BtnCal and it text to Calculate. Click on the Calculate button and enter the following code. A lot of people are obese now and it could affect their health seriously. Obesity has proven by the medical experts to be one of the main factors that bring many adverse medical problems, including the cardiovascular disease. If your BMI is more than 30, you are considered obese. You can refer to the following range of BMI values for your weight status.